I will introduce Japanese music and major Japanese musical instruments. The oldest document about Japanese music is Kiki Kayo which is said to be the source of Japanese first books Kojiki and Nihonshoki. Around 7th century, music came from Korea and China. It was mixed with Japanese ancient music and Gagaku (Japanese court music with wind, string and percussion instrument) was born. 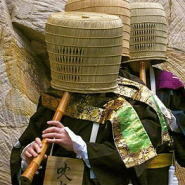 When dance is added to Gagaku, it is called Bugaku. At the same period, Seimei (Buddhism music) came from India through China. It is the source of Heikyoku (historical story song with Biwa, string instrument) and Yokyoku and influenced later to Joruri. On the other hand, Dengakuno was born by mixture of Denbu (rice planting ceremony music) and Sanbu (Chinese dance music). Dengakuno was organized to Nogaku by Kanami and Zeami in 14th century. The music in Nogaku was called Yokyoku. In Muromachi era (14-16th century), Kouta (consists of 26 letters) became popular. In Edo era (17-19th century), Shamisen (revised Jabisen from Okinawa) was started to use for Joruri. Then it developed to Ningyo Joruri (puppet theater with music). Gidayubushi (Narration with Shamisen music which Gidayu Takemoto started) became indispensable for Ningyo Joruri. In Edo era, Kabuki introduced the programs and Gidayubushi from Ningyo Joruri because it was more popular. By these transformation, Kabuki became more music and dance oriented theater. Nagauta, which was sung along with accompaniment of Shamisen in Kabuki, was popular and later became independent music. In 20th century, by the spread of radio, popular music prevailed all over Japan. There were two streams of popular music, one is Enka (emotional ballad using Japanese scale) and the other is pops influenced by the western music. Compared to western music, the followings are the major characteristics. - It is neither explained with equal temperament nor just intonation in western music. - There is time without any notes. Afterglow is important. - There is no score. Music has been handed down by mouth or by copying the master's play. - There is a lot of discordance. - The length of one beat is not constant. The musical instruments are made to enjoy the delicate change of the sound in the small room. So, compared to western instrument for the big concert hall, they sound lower. Japanese 13 strings harp。The characteristics is having pillars to support the strings. You can highten the pitch by stretching the string using pillar. It also transmits the vibration of the string to the body. The string is made of silk (now polyester is mainly used). String is picked by the artificial nail made of ivory put on three fingers. It is played either solo or with Shakuhachi and Shamisen. Shamisen is comparatively new instrument made by transforming Jabisen (Three-strings) introduced from Okinawa in 15-16th century. It consists of 3 parts Tenjin (pegbox)、Sao (neck) and Do (body). 3 strings are made by silk (or nylon) and the skin of the body is made by the skin of cat or dog. By pressing the string at the neck, you can adjust the pitch. And by picking the string by plectrum at the body, you can make the sound. 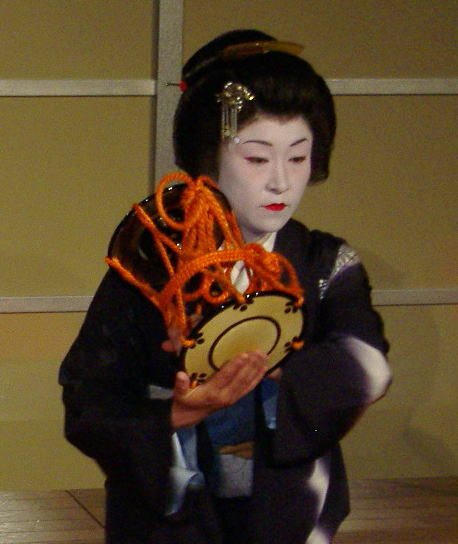 It is played either solo or as accompaniment of Kabuki, Joruri or Nagauta. 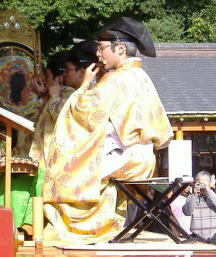 Shakuhachi is a traditional wind instrument which literally means 1 shaku 8 sun (54cm), the length of the tube. It originally came from China and Zen Buddhist monks played it when they beg. It became popular among common people in 19th century. Hollowing the bamboo and make 5 finger holes and 1 blowing hole. The player sounds it by adjusting the bunch of air by the shape and angle of mouth. It is played either solo or with Koto and Shamisen. It is also used as accompaniment for Japanese folksongs. Tsuzumi means dram and it has variety of size, but in narrow sense, it indicate small dram. Stretching the skin on both sies of sandglass shaped body, and tighten the the dramhead by the cords. Pitch can be changed by adjusting the tention of the cords. The player puts it on the shoulder and plays with fingers. It is used as accompaniment of Nogaku and Kabuki. You may have chances to see these instruments explained above. Other than these, there are some instruments still used in Japan. Kokyu: String instrument like cello. Biwa: String instrument like mandolin. Sho (wind instrument), Hichiriki (wind instrument), Shoko (metal percussion), etc. are used.